I first had crushed lentil soup at my all time favorite Lebanese restaurant- The Grape Leaf. This soup was a turning point for me in my culinary repertoire. Prior to this soup, I pretty much thought that soup was Lipton’s chicken noodle soup that my mom would make from a packet when I was sick or some hearty but fairly unhealthy soup, like my college’s baked potato soup (tasty but high in calories). 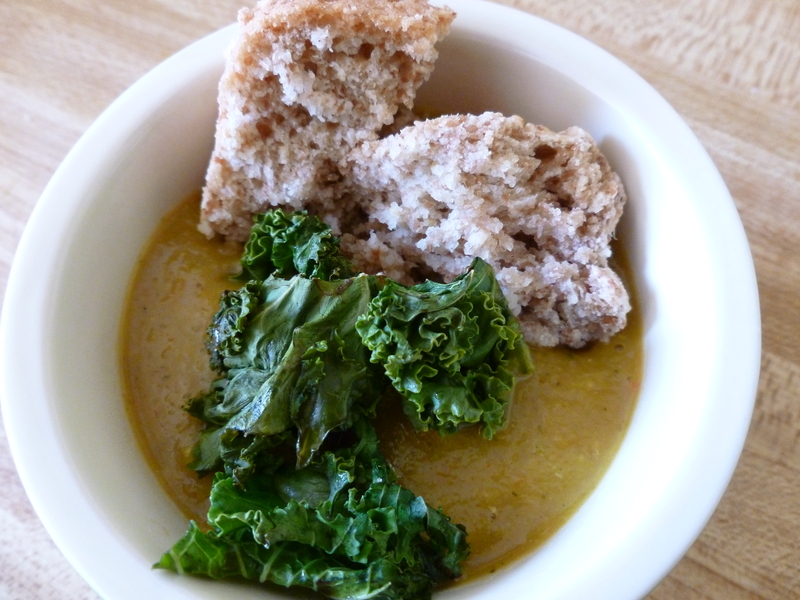 After tasting the Grape Leaf’s crushed lentil soup, I realized two things: 1: I love lentils! and 2: Soup can actually be pretty darn good. This soup could be vegetarian- pretty much just substitute the broth/stock for vegetable broth! (I almost made it vegetarian, but I couldn’t get the vegetable broth jar open. Doh!) I actually found the original version of this soup in one of the editions of the Moosewood Restaurant cookbooks— a tome of vegetarian recipes that the Moosewood Collective puts out every so often, filled with creative and tasty vegetarian foods. I make this soup pretty much as often as I make cornbread (they’re YUMMY together)– so at least once a month, if not more. 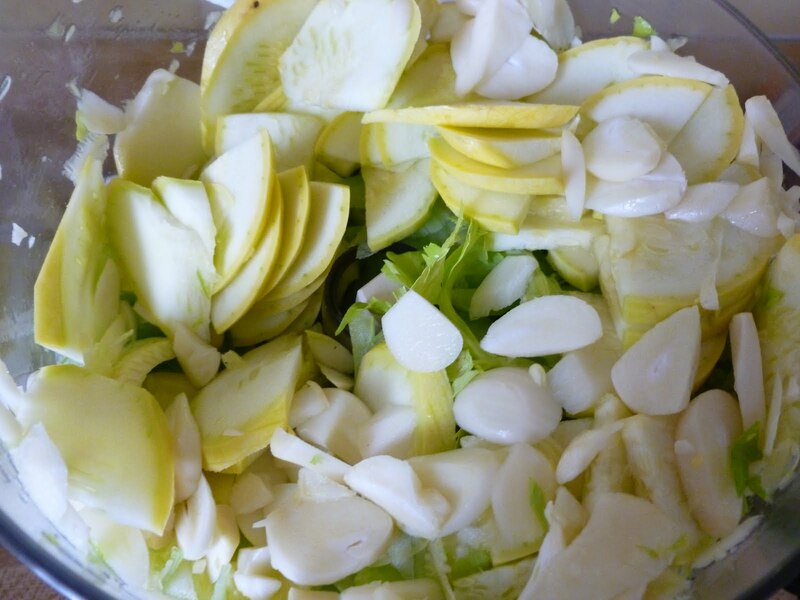 Chop up your vegetables, except garlic, into roughly the same size pieces– you just want them to cook evenly. They’re going to get blended later, so they don’t have to look pretty! If you like, you can slice or chop them up with a food processor. Dice the garlic. 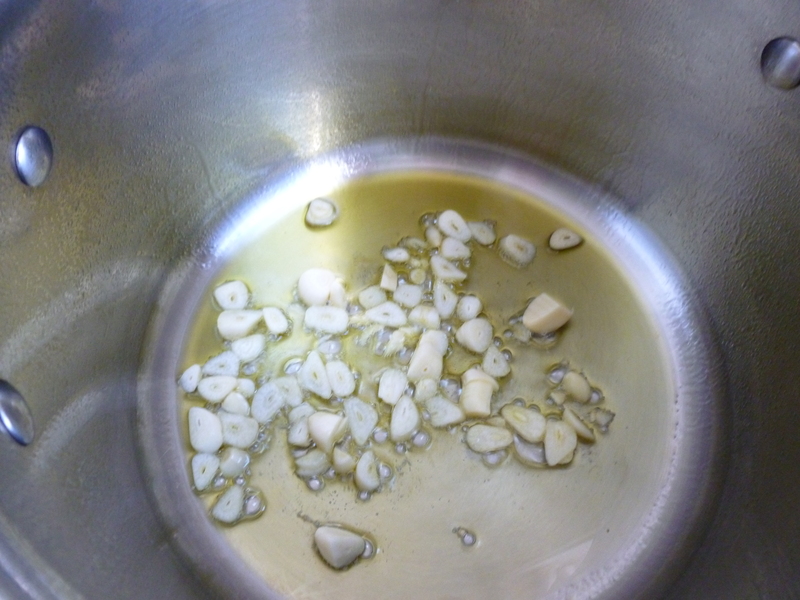 In a large stockpot, heat the EVOO and garlic on medium heat for 1-2 minutes, or until the garlic has begun to turn golden (but not crispy). 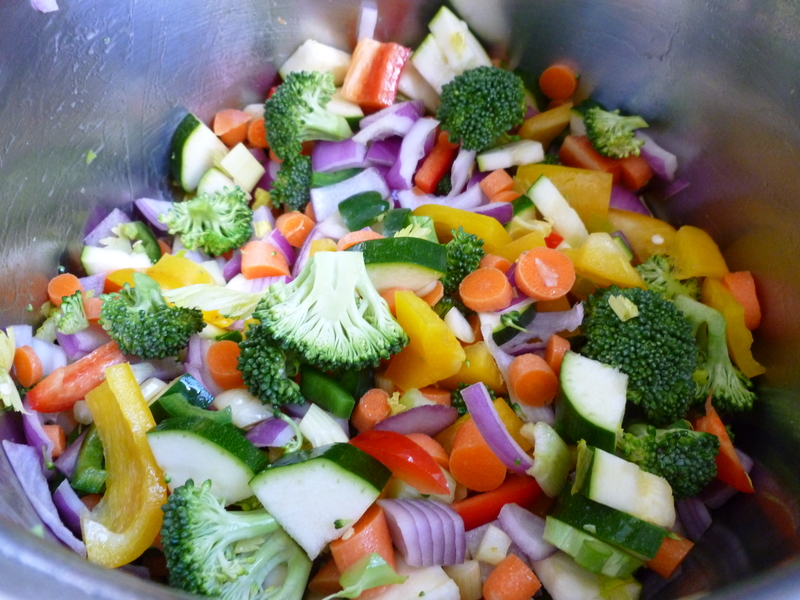 Add the rest of the vegetables and stir to coat them with the EVOO. Now, add your spices and stir again. Place a lid over the pot to get cookin’! 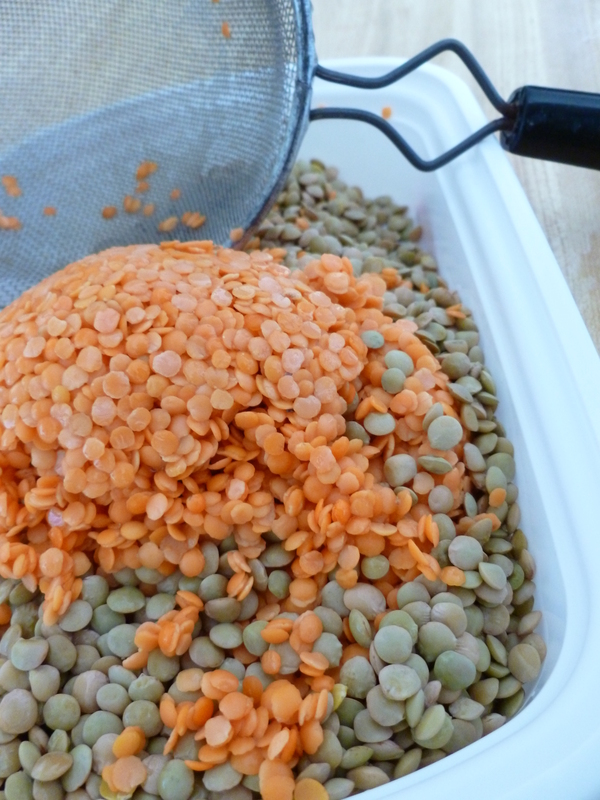 While the vegetables are cooking, rinse and drain your lentils. Be sure to pick out any small rocks or debris. I used a mix of brown and red, but you can use your favorite variety. I’ve been trying to find French green lentils, as I’ve heard they’re exceptionally tasty. Add the rinsed lentils to the vegetables. 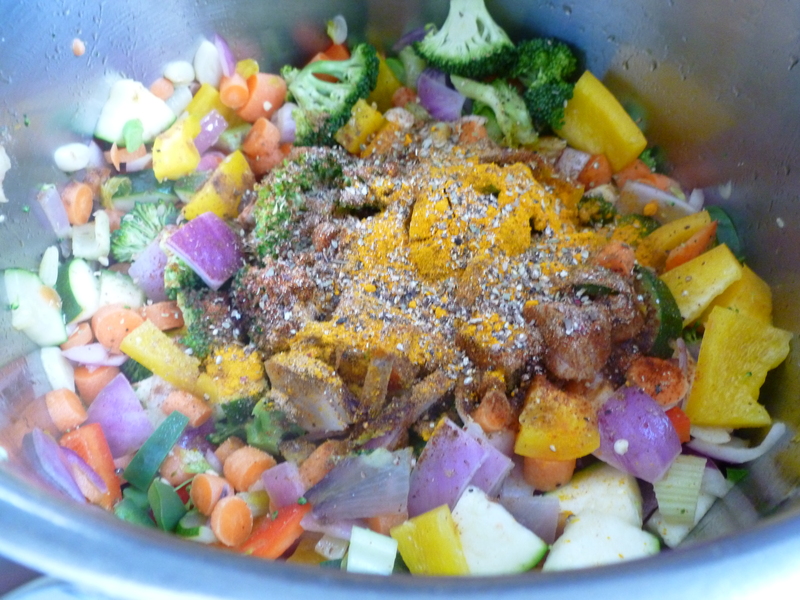 Pour the heated stock into the vegetable-lentil mixture and stir until combined. Let the soup simmer, with the lid on, on medium heat for 20-30 minutes. 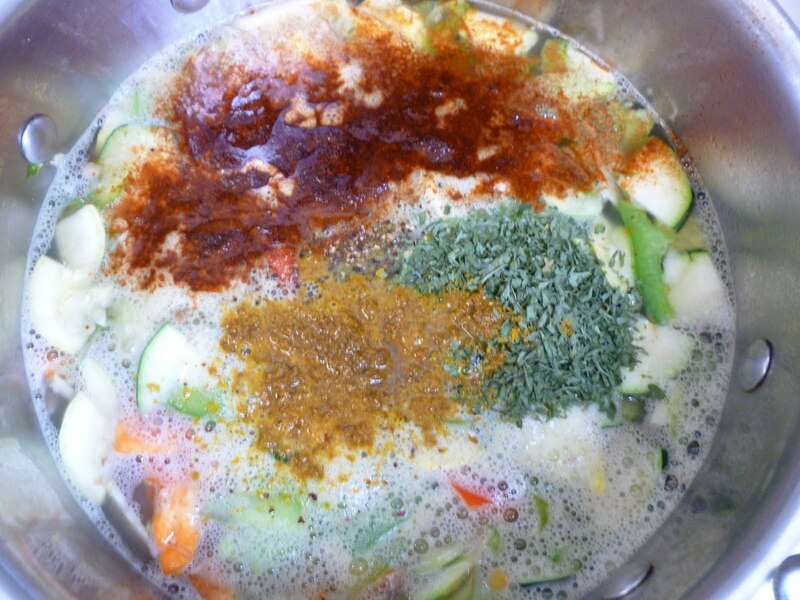 Your soup will look like this when its about done. Test the lentils and vegetables with a tasting spoon (Those plastic spoons you get from take out are perfect! Yes, I am one of those people- I reuse plastic utensils). If the lentils and veggies are tender, and you’re satisfied with the seasonings, remove the pot from the heat and over to a stable flat area, like your counter. Be sure to use potholders! 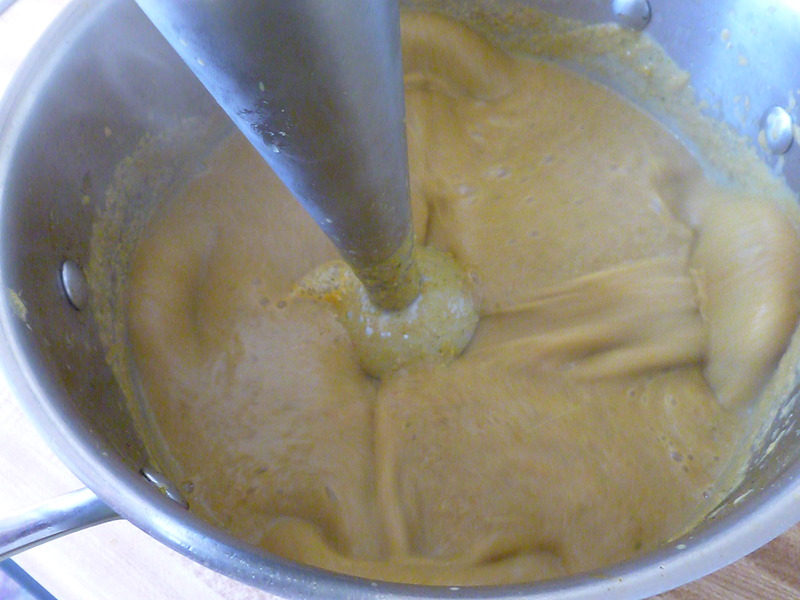 If you have an immersion blender, you can start blending up the soup right away. If you’re using a blender or food processor, you may want to allow the soup to cool down (for your safety) before blending. Blend the soup for 2-3 minutes, until fairly smooth. Ultimately the texture is up to you, so be sure to taste the soup at various stages until you’re happy (coarse, medium, fine). I generally prefer a finely blended soup. Zest and juice one lemon (if you don’t have a lemon on hand, you can omit the zest and just use the juice). Stir in the lemon juice (lemon juice tends to break down when heated, so to retain the flavor, add at the end of the cooking process). 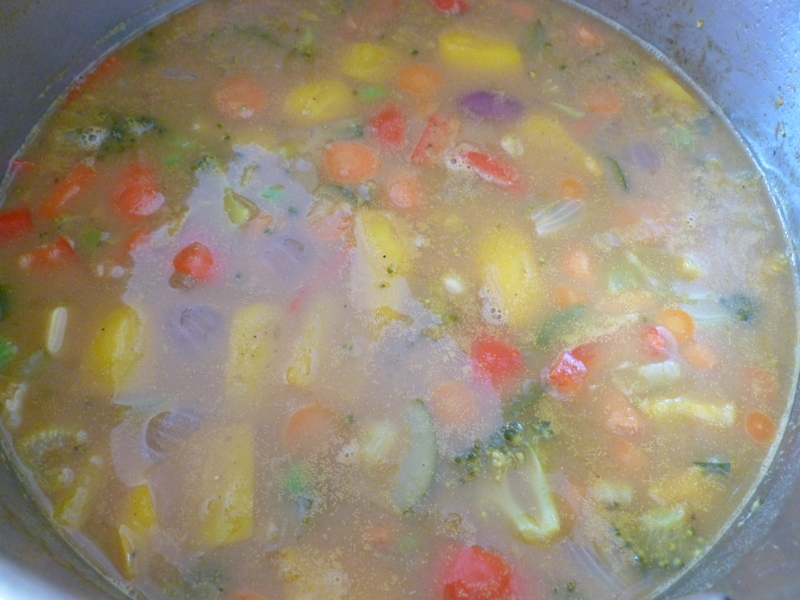 Taste the soup, and add more lemon juice if desired. If you cooled the soup down, gently reheat the soup before serving. Garnish, if desired, with bread and kale chips. Serve hot! Winter is back again, and snow on the ground means that a hot bowl of soup is the perfect meal. Cooking in the kitchen seems to make my chilly apartment warmer (nevermind that I have the heat cranked up to 80 degrees). 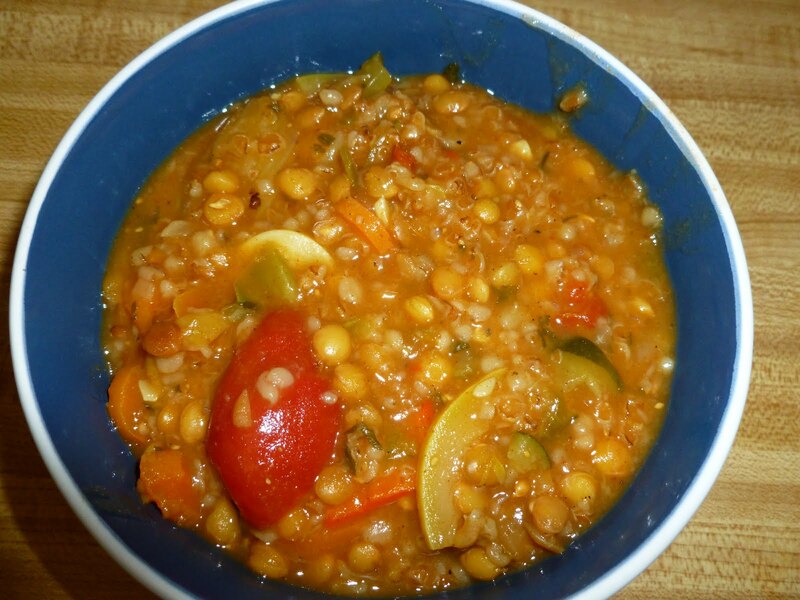 I thought I’d try this hearty soup to use up some of the barley that’s been sitting in my fridge forever. I found my inspiration for this soup on AllReceipes.com but as usual I quickly deviated from the instructions to develop my own creation. 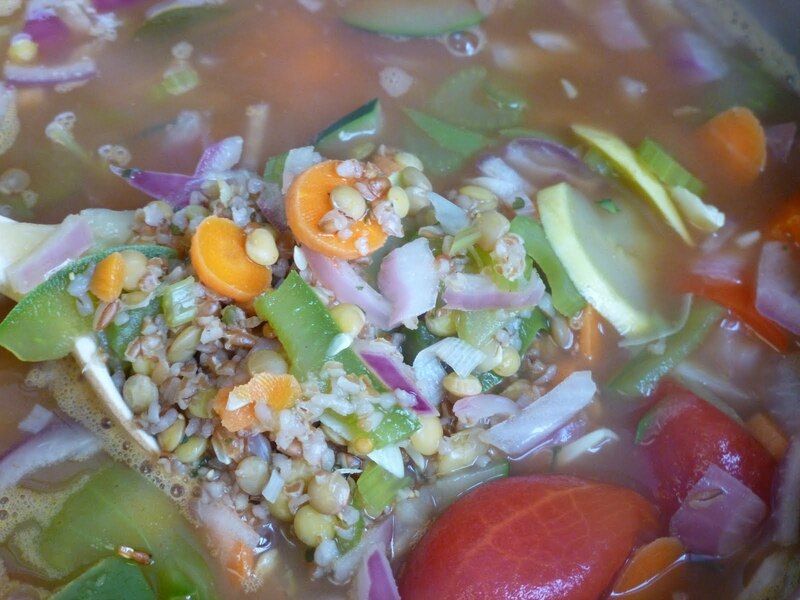 This is a simple but hearty winter soup loaded with veggies and healthy grains (and my favorite legume- lentils <3). In a large stockpot (and I do mean large!) begin heating your broth on medium high. I used about 3 tsp low sodium chicken bouillon powder mixed with the water- you can add more but that’s all I had left! I microwaved my water prior to adding to the stock pot to cut down on cooking time. chopped by hand, but that’s a tradeoff I’m willing to make when my stomach is grumbling. Also- feel free to substitute your favorite veggies for the ones listed above. 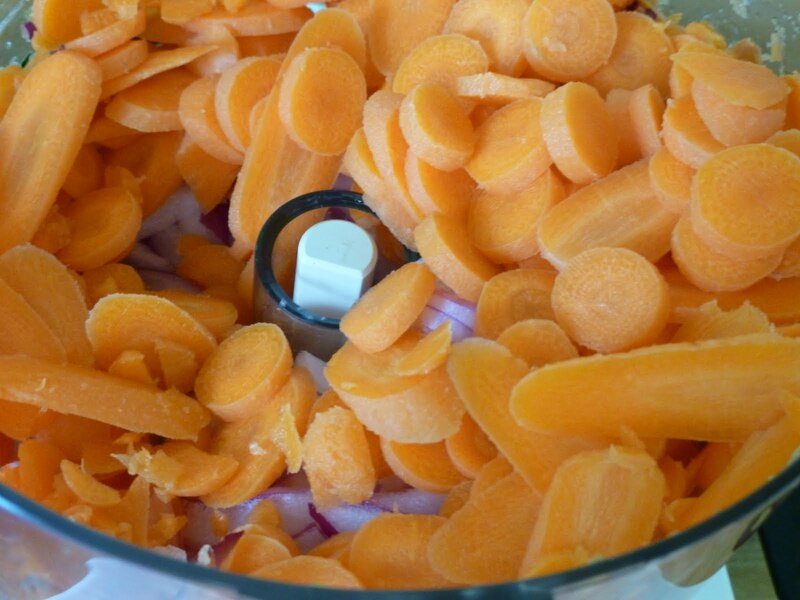 The garlic, carrot, celery and onion are typically considered the core “aromatics”- so try to use them if you have them on hand. (I promise you won’t taste the onion). Add in the barley and rinsed lentils. Stir to mix the ingredients together. Your pot should be pretty much full now. Add the bay leaves and spices and stir. 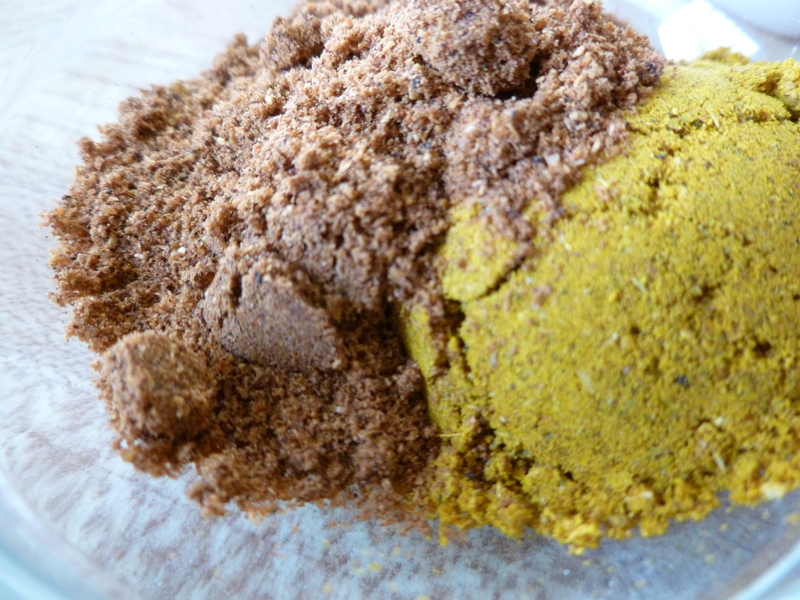 Since the recipe already called for curry, I thought an Indian flare might be interesting, so I added cumin and garam masala (a blend of spices that has a kind of sweetish spicy flavor). Let the soup cook on medium high until the mix comes to a boil, stirring occasionally- for about 15-20 minutes. Cover loosely. 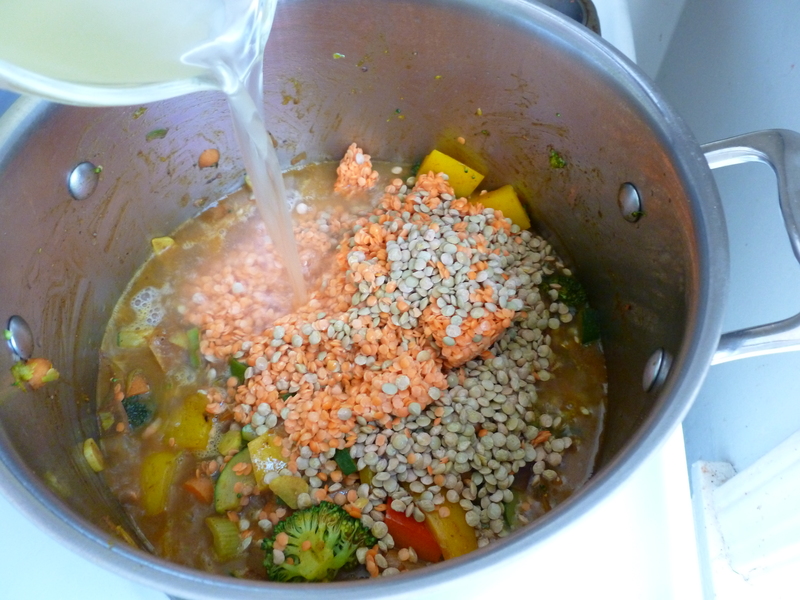 The barley and lentils will absorb the liquid and thicken the soup. 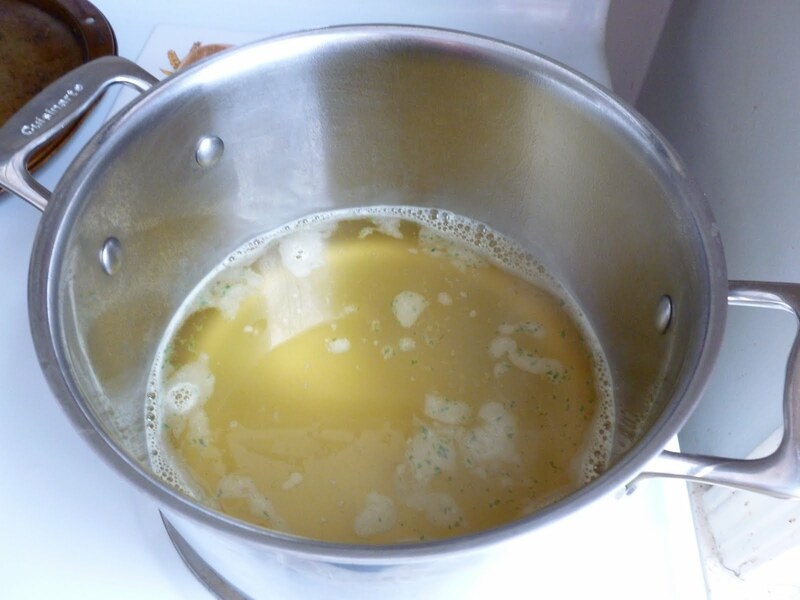 Once the soup has reached a boil, reduce the heat to medium or medium low. 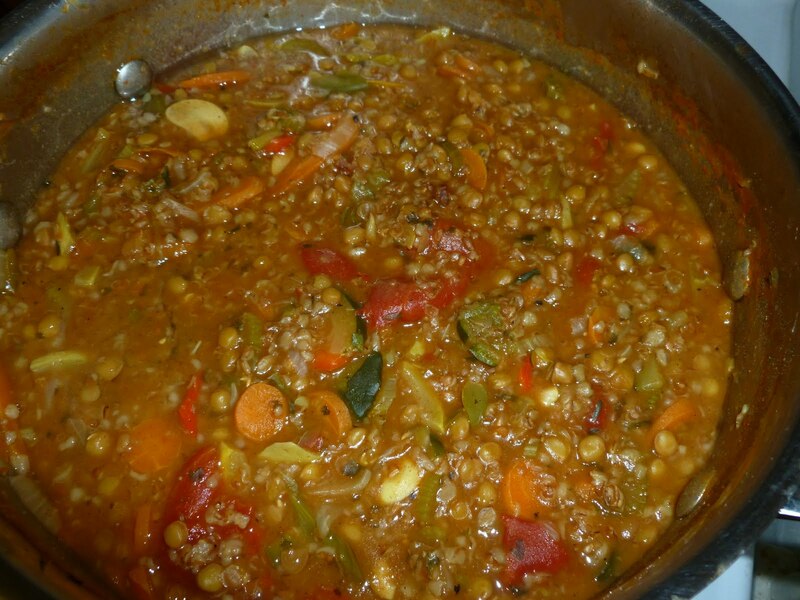 Simmer the soup for another 15-30 minutes, until the barley and lentils are tender and the soup has thickened. Let the soup cool for 5-10 minutes. Serve with a hearty crusty bread or cornbread. Enjoy!